Do you often find yourself setting out big plans, only to fall flat and push the plan aside? This is a common occurrence. Luckily, there exists a well-defined solution that's easy to follow. It comes in a detailed system of measurable goals and objectives that puts you on a path to success. Measurable goals and objectives are essential for evaluating progress in any situation, be it work, learning, or personal development. When a goal is specific and measurable, it's more likely to be achieved. For anyone who is easily overwhelmed or struggles with time-management, this system will help you stay on track. A popular mnemonic, S.M.A.R.T. helps people remain on a path to academic, professional, and personal success. The S.M.A.R.T. system enables individuals to devise a solid plan with concrete and measurable goals, leaving very little to chance. S.M.A.R.T. stands for Specific, Measurable, Achievable, Relevant, and Time-bound. Let's take a closer look. Specific: Goals should be written in the most simplistic manner possible, honing in on one specific outcome. Without this core principle, you might find it hard to focus and, in the end, feel unmotivated. Bad: I want to be a better student. Good: I'm going to focus on boosting my overall grade in MAT 101. Measurable: Goals need to be measurable in such a way that tangible evidence can be presented along the way. It's fun to track your milestones! This can be as simple as setting a specific date for your achievement. Bad: I'm going to study for this Friday's math test. Good: I'm going to study every day and then meet with a tutor on Wednesday to prepare for Friday's test. Achievable: Goals should be designed like a good workout. They should stretch you slightly, so you feel challenged, but not cause stress or injury. Bad: I'm going to lose 20 lbs. Good: I'm going to lose 2 lbs. every week by choosing healthy meal options over processed foods. Relevant: It's important to examine your goal. Make sure it's relevant and realistic. Time-bound: Goals should be linked to a timeframe that creates a practical sense of urgency, creating a healthy tension that will propel you forward. Bad: I want to submit a short story in the contest next month. Good: I'm going to draft an outline for my first short story this Wednesday. This system is sure to provide structure and accountability in your professional, academic, or personal life. Let's take a look at a few examples that might help you build out your own goal-setting system. Overall Goal: I want to run my own consulting business. S.M.A.R.T. Goal: Within one month, I will land my first client after organizing a sensible plan for sending out pitches. Specific: Using my network, I will seek out companies in need of my consulting services. Measurable: I will pitch my first three clients within two weeks, aiming to pitch five per week thereafter. Achievable: I will competently outline what I can do for businesses, I will perfect my pitch, and work on my portfolio. Relevant: Knowing this is something I'm good at, I will utilize my contacts and remain focused on my dream to do work I enjoy. Time-based: I will start pitching clients immediately; within a month, I will have my first paying client. Overall Goal: I want to be a better student. S.M.A.R.T. Goal: I will target my lowest class average in order to raise my overall GPA. Specific: I want to improve my overall GPA so I can apply for new scholarships next semester. Measurable: I will earn a B or better on my MAT 101 midterm exam. Achievable:I will meet with a math tutor every week to help me focus on my weak spots. Relevant: I'd like to reduce my student loans next semester. Bringing up this low class average will open new doors for me. Time-based: I still have six weeks until midterms. This leaves me plenty of time to meet with a tutor and decide if any additional steps are necessary. Overall Goal: I want to lose weight and be in better health. S.M.A.R.T. Goal: I will focus on my food habits, and I will begin to lead a healthier lifestyle. Specific: I will cut down on junk food as a first step toward overall good health. Measurable: By December, I will only have organic foods and healthy snacks in my pantry. Achievable: I will see a nutritionist to design a healthy eating plan. Relevant: This will cure some of my nagging ailments e.g. fatigue, lower back pain. Time-based: In September I will change my eating habits. In October I will start walking more. By the holidays, I'll be able to indulge a little without ruining my new healthy habits. Did you notice all the instances of "I will" in the above examples? Keep telling yourself that you will do this, that you can do this, not just that you'd like to. You started achieving your goal the minute you wrote S.M.A.R.T. on that fresh sheet of paper. It's true that stress doesn't always leave room for motivation. However, if we chip away at small projects, little by little, following S.M.A.R.T. goals, we will start to see positive changes emerge. The simple act of checking things off our goal sheets is profoundly rewarding. That small act can have a domino effect down a whole stream of other activities. Writing down measurable goals and objectives help you stay on track and stay encouraged. Dream as big as you'd like. Just make sure you start with specific and measurable milestones that are achievable and relevant. Making your goals time-based means you just might get there this time and watch your plans finally take shape. "Examples of Measurable Goals and Objectives." YourDictionary, n.d. Web. 18 April 2019. 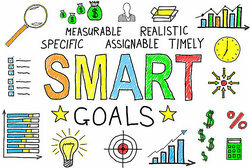 <https://examples.yourdictionary.com/examples-of-measurable-goals-and-objectives.html>.